Ever since Martha Stewart was a teenager, the New York Yankees baseball team has been her favourite. Early episodes of her television show, Martha Stewart Living, would sometimes show Martha wearing a New York Yankees ball cap in the garden or while demonstrating some DIY project. 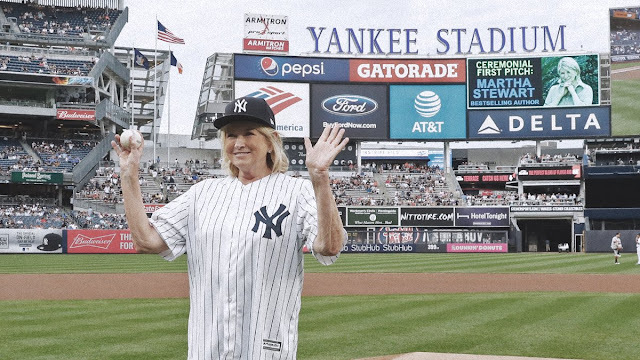 On Tuesday, July 31, Martha made one of her dreams come true by making the first ceremonial pitch at the Yankees game at Yankees Stadium where the team went on to beat the Orioles 6-3. I'm not much of a sports fan, but it was really fun seeing Martha make the pitch. She had tweeted about wanting to impress her grandson, Truman, and had posted several posts on Instagram of her practicing her pitching skills with her personal trainer. You can watch Martha's pitch by clicking here. She did really well!